Ha Long Bay (Vietnam) – October 24, 2018 (travelindex) – Best Western Hotels and Resorts announced today the signing of an impressive new upscale hotel overlooking Ha Long Bay, the iconic UNESCO World Heritage site in Vietnam. 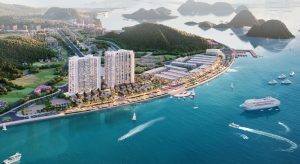 Developed by Doji Land Real Estate Investment Company Limited, the Best Western Premier Sapphire Ha Long is a spectacular new 31-story project that is currently rising in the heart of Ha Long City’s hotel district. It will feature more than 1,000 spacious guestrooms, outstanding business and leisure facilities and panoramic views of the bay. The hotel is scheduled to open its doors in the fourth quarter of 2020. Upon opening, this exceptional hotel will feature 1,008 residential-style rooms with a minimum size of 35 square meters and a choice of one or two bedrooms. Each unit will feature contemporary décor, a private balcony and modern technology, including complimentary Wi-Fi. “Best Western Premier Sapphire Ha Long is a fantastic new hotel that provides international accommodation in an unsurpassed location, in the heart of one of the world’s most desirable destinations. As a globally recognized World Heritage site and one of the ‘New7Wonders of Nature,’ Ha Long Bay is the jewel in Vietnam’s tourism crown. Our wonderful new waterfront hotel will perfectly showcase this breathtaking landscape,” said Olivier Berrivin, Best Western Hotels & Resorts’ Managing Director of International Operations – Asia. “This landmark signing is a wonderful example of how Best Western’s portfolio is evolving in Asia Pacific. As a fully managed property, Best Western Premier Sapphire Ha Long will benefit from our company’s 70-plus years of hospitality expertise and extensive global support network. Sleek, stylish and spacious, this landmark hotel will combine seamless stays with stunning views. We look forward to working with Doji Land to bring their vision to life, and to welcoming our first guests to Ha Long Bay in 2020,” Olivier added.